The daikon are finished and the field cleaned. The greens, with the exception of a few rows of komatsuna and spinach, are finished and tidied as well. The kabu went much too fast, and the cabbage finished up only last week. The broccoli is still coming along, and in my own garden I've still got a nice selection of winter greens and vegetables. (I tend to plant my own after we finish the fields, and despite two salads a day nearly every day plus rounds of blanching and freezing my harvest is a bit slower.) We've prepped two fields for spring planting already, and within the next few weeks I'm sure I'll learn where the tomatoes, eggplants and beans will land this year. The plum trees are decked with blossoms, and birds seem to be everywhere doing what birds (and bees, so I hear) do in the spring. 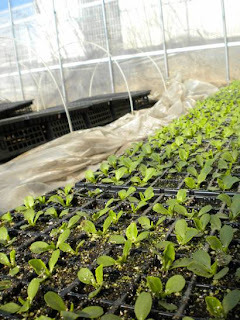 And sure enough, it's spring in the greenhouse. 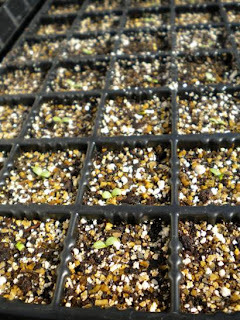 The first planting of lettuce seedlings are well sprouted, and the second set is just starting to stretch its futaba (first leaves). (If you squint at the second photo you'll can perhaps see them.) The next round of broccoli is still gathering energy, although when I watered this morning I noticed some cells with tiny leaves pushing up. 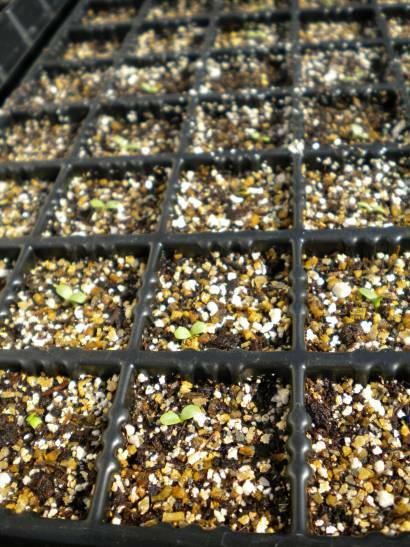 As much as I feel a bit hesitant to give up these bright cool days of winter, I can't help but feel a twinge of excitement as I see those sprouts. Wonderful! Which sprouts are putting in?